Watch from 5:18 for Jello’s rap on Bradley Manning, Julian Assange and Edward Snowden. Jello Biafra (ex-Dead Kennedys NOW Guantanamo School of Medicine (GSoM) spoke out for Bradley Manning, Edward Snowden and Julian Assange at GSoM gig at Dingwalls, Camden, London, August 12th. 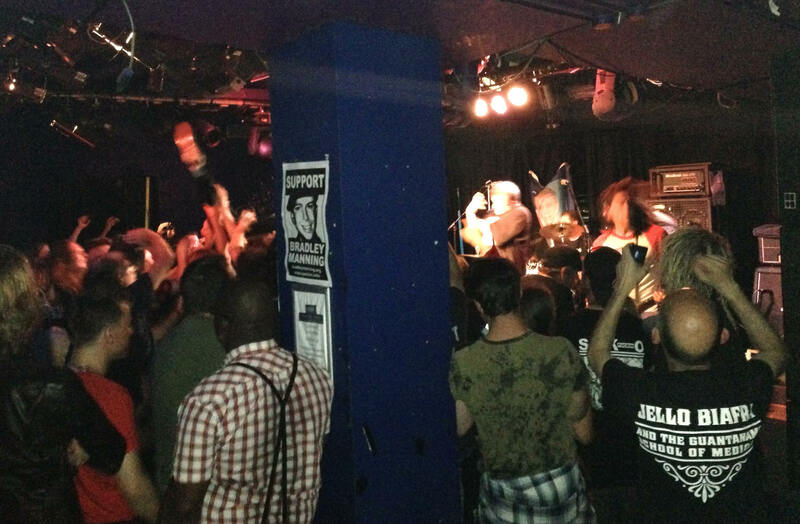 A “Free Bradley Manning” banner hung behind the band, Jello wore a “Free Bradley Manning” t-shirt during the set. The 2+ hour gig was epic and also can be rated as the largest London public meeting in support of Bradley Manning during our 3 years of solidarity work for the tortured, slandered and imprisoned WikiLeaks Whistleblower. 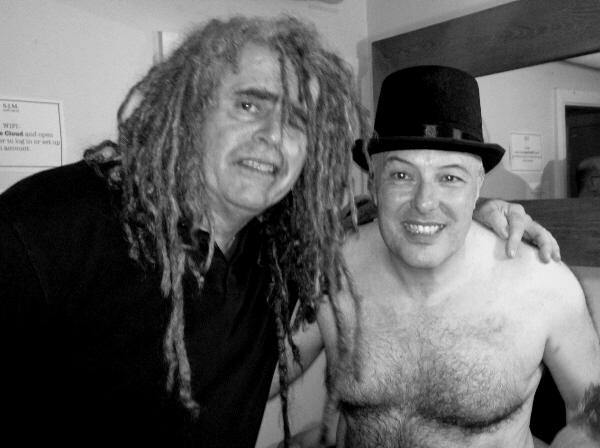 Thanks to the empathy, solidarity and eloquence that is Jello Biafra a new constituency of London punks were engaged in this the week of Manning’s sentencing at NSA HQ, Ft. Meade, Maryland USA. This gathering went way beyond preaching to the choir, it went out to people and to places we don’t know who and where yet. What the varied responses will be over the long years of Bradley’s imprisonment ahead, only time will tell. With a little bit of effort and some good friends willing to step up on short notice, we managed to bring the London punk mountain to the Manning/Biafra mountain at Dingwalls/ Camden. 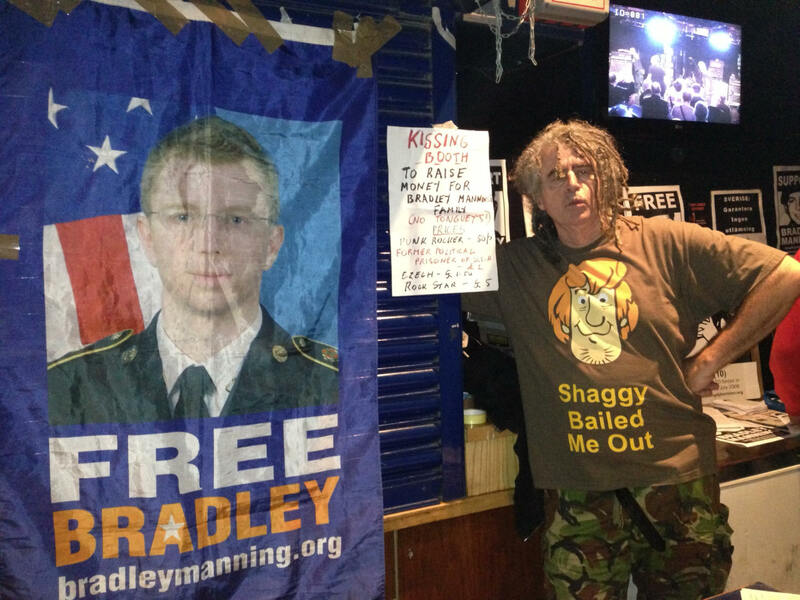 The well positioned Bradley Manning solidarity stall at the gig went really well. We distributed flyers on how to view the Welsh National Theatre production “The Radicalisation of Bradley Manning” presently being performed and live streamed from Edinburgh (see this post for more information) and flyers instructing punks how to financially support Bradley Manning’s Wales based family to support Brad in prison in the U.S. 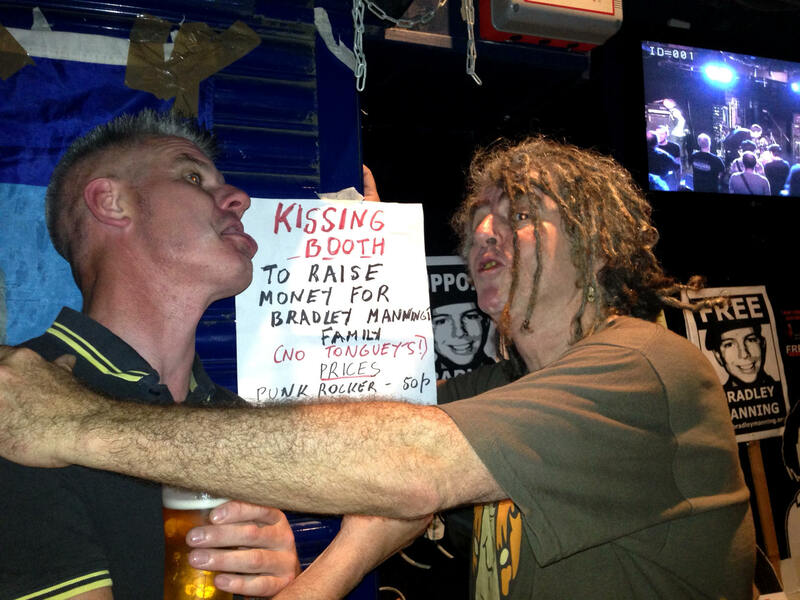 THE BRADLEY MANNING SOLIDARITY KISSING BOOTH NEEDS FINE TUNING! The “Bradley Manning Solidarity Kissing Booth” to raise funds to defray U.S. prison visiting costs for the Welsh based maternal Manning family, didn’t do so well. This fundraising idea could have been way ahead of its time or quite a deal behind the times. That’s the problem when you take your ideas from episodes of “Scooby Doo”. But Casey Kassem, the voice of Shaggy had put up 20 grand bail for me (out of a total of 50 grand) when I was held after completing my B52 plowshares sentence in 1993. Sealing the deal – a quid in the pint glass but the sign says “No Tongueys” matey! We made more money out of serving as an alternative cloakroom as the devoted left their bags with us and headed for the sweating, heaving mosh pit. Today, Wednesday, Bradley Manning is due to take the stand at the sentencing stage of his court martial. He will be sentenced (max now 90 years) next week. – $300 AUS at a gig in Brisbane 2012 (similar amount was raised at this gig for the Assange family). Report from gig. — 33 quid at an event at Giuseppe Conlon House (GCH) on 4th August. – 68 quid at the Jello Biafra gig 12th August. Over the past 3 years, members of Bradley’s Welsh family have self funded their trips to the U.S. to visit Bradley in pre-trial detention including one visit while he was being tortured in Quantico. We want to support them to support Brad, by contributing towards the cost of their future visits. Brad remains in chains for us, we remain on the loose for him. The London crew were back in action this afternoon outside Camden Town tube station, standing in solidarity with Bradley Manning as he, his sister and their aunt took the stand in the sentencing element of his trial. About 1.5 hours into our Camden vigil with John “the axe” McClean in full voice, I ripped up a discarded fruit box harvesting a slightly blemished peach (which I ate) and made a sign about fundraising for the Wales based Manning family. Lots of flyers handed out and a beautiful electric blue mohicanned young lesbian, on holidays from Adelaide, joined in the vigil spontaneously for 1+ hour. 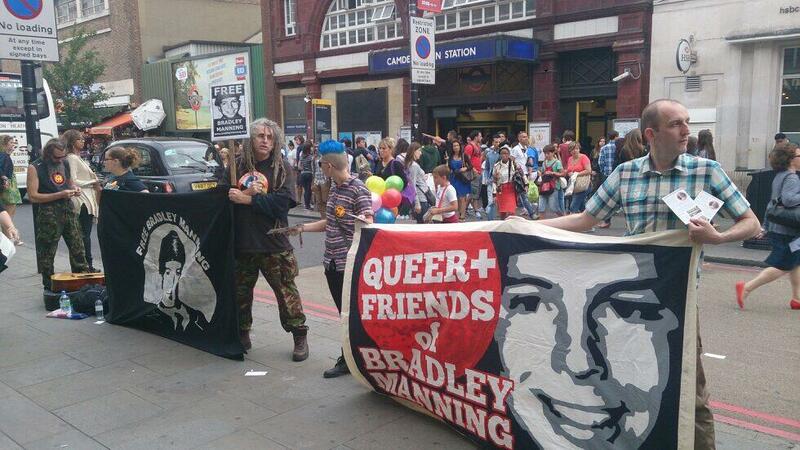 She and Oliver were stoked to be able to hold the Queer+ Friends of Bradley Manning banner. Not just a great musician, a great guy is that John McClean. Go to his free jam sessions in Dulwich football club first Wed evening of the month! God loves a tryer, hates a chancer – and the jury is still out on you! Get ready to take action when Brad is sentenced. Add your planned gathering point to this list. Gallery | This entry was posted in Manning, Reports and tagged benefit gig, Bradley Manning, Camden, Catholic Worker, Dingwalls, Guantanamo School of Medicine, Jello Biafra, London, solidarity. Bookmark the permalink.